New York, NY, U.S.A.: Warner Books, Incorporated, 1990. 218 pp. By the author of The Grunts. What life was like behind the front lines of Vietnam. The Marine Corps Gazette said of the book: "A Candid Look inside Nam's rear echelon - where the motto was "in the Rear with the beer". Cover has very min wear. Gift inscription to former owner on title page. Text is very clean, tight, unmarked. Gently read if at all.. First Warner Book Edition. Mass Market Paperback. Very Good +. 7 x 4 1/4. London: D. C. Thomson and Co., 1983. 65 pp. Commando Magazine. War Stories in pictures. Pilots of the mighty Hurricane II D aircraft patrol the North African desert. There is no room for mistake. Softcover has a couple of very faint creases, not major flaws. One corner fold on p. 34. Text is very clean. A nice copy.. Soft Cover. Very Good. 7 x 5 1/2. Toronto: McClelland and Stewart Ltd., 1946. 307 pp. Covers the period from Jan. 1, 1945 to August 16, 1945. Records the War Prime Minister's reaction to victory and his approach to the problems resulting from victory. DJ has scuffing to front cover, a little edgewear and some moisture staining along back spine. Brightened by new mylar cover. Cloth on boards binding has some bumps to corners but is lovely and bright. Sticker pull to front free endpaper. Text is clean secure and unmarked.. First Printing. HC and DJ. Good/Fair - Good.. 8 1/8 x 5 5/8. New York, NY, U.S.A.: Viking Penguin, 1983. 670 pp + Chronology + Cast of Principal Characters + notes on sources + acknowledgements + photo credits + index. b/w photos throughout. A companion to the PBS Television Series. 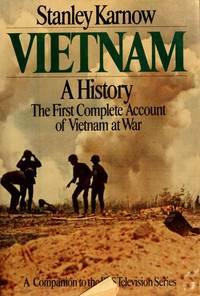 The First Complete Account of Vietnam at War. ". filled with fresh revelations drawn from secret documents and from exclusive interview with hundreds of participants on both sides. Dj has some tears to edges. Looks good in new mylar cover. Book has moisture staining and damage to back but not a major defect. No former owner's name. Text is secure. A good copy for reading.. HC and DJ. Good/Good. 9 1/2 x 6 1/4. London: D. C. Thomson and Co., 1983. 65 pp. Commando Magazine. War Stories in Pictures. The story of British Lieutennt Hugh Standerline as German war machines rolled into France. Could he live up to his father's heroic exploits? Softcover has faint creases to back corners. No tears. Text is clean and unmarked. A good copy.. Soft Cover. Good. 7 x 5 1/2.